Place pork in shallow dish. Combine maple syrup, Dijon mustard, sesame oil, garlic, and pepper. Pour over pork and coat thoroughly. Cover and marinate at least 8 hours or overnight. 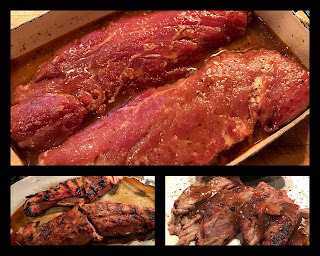 Remover pork from marinade and set aside. Transfer marinade to small saucepan. Bring to boil, reduce heat, and cook over medium-low heat for 5 minutes. Grill pork 15 - 20 minutes or until desired doneness. (Could be less time depending on thickness ... check with your meat thermometer on how you like it cooked and allow time to rest where temp rises). Carve tenderloin on an angle and serve topped with heated marinade. Using a sharp sturdy chef's knife, carefully cut squash in half, from stem to tip. Scrape out seeds and stringy bits inside until smooth. With a sharp knife, score inside of squash in a cross-hatch pattern. Place squash halves, cut side up, in roasting pan. Pour 1/4 inch of water over bottom of pan so squash does not burn or dry out. Rub butter into inside of each half. Sprinkle with dash of salt (if not using salted butter). Sprinkle with cracked freshly ground pepper. Crumble brown sugar over each half and drizzle with maple syrup. Remove from oven and cool a bit before serving. 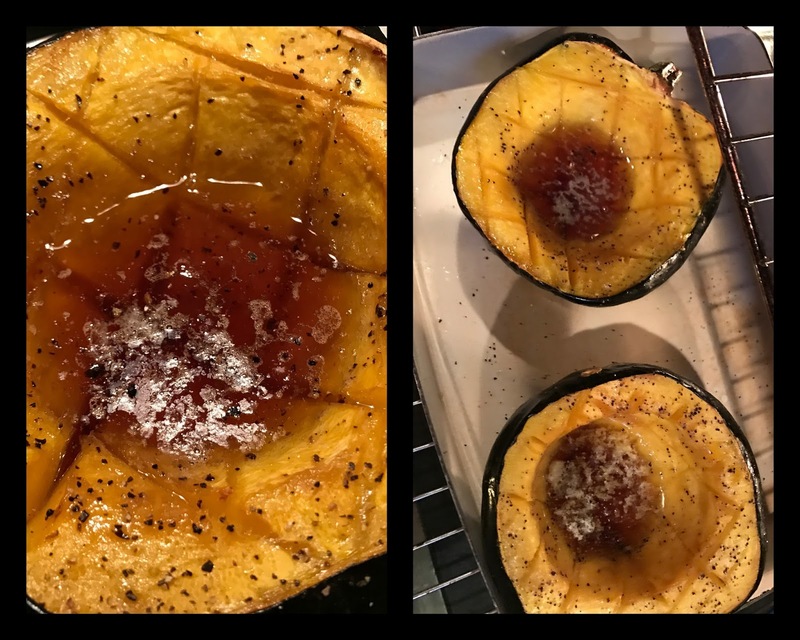 Spoon any buttery sugar sauce over entire squash. Your posts always make me hungry, especially because I don't cook as much as I used to. Guess I'll just have to enjoy your food vicariously! I'm going to have to go out right now and buy an acorn squash! 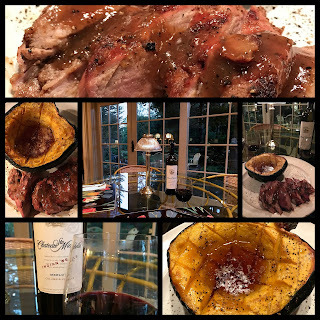 This brings back memories of my childhood, too, because my mother always raised a few acorn squash in her garden so it was a frequent autumn side dish. 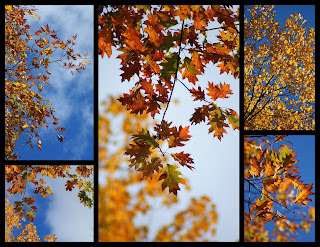 I agree with Anne--this October has been spectacular so far. Happy Autumn, Joey! Ok, this is a keeper for me. Think maybe the Maple syrup has something to do with it.